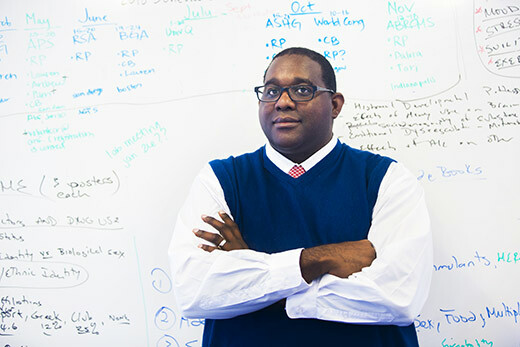 Rohan Palmer, an assistant professor of psychology in Emory College, started on the path to becoming a researcher as an undergraduate, when he worked in a lab studying whether female mice could overcome their anxiety to leave the safety of the nest to retrieve babies that he and other researchers had moved away. Intriguingly, the work showed that some strains of mice performed very differently than others in overcoming their emotions to perform their motherly duties. Moreover, females exposed to more testosterone in the uterus performed worst at this and other maternal tasks. Palmer now runs his own behavioral genetics lab at Emory that turns that question to one of today’s most pressing issues: What makes some people addicted to drugs or alcohol, and not others? His highly innovative approach, to find and characterize the layer of biology that combines with factors such as environment to find an answer, has earned him a 2017 Avenir Award for Genetics or Epigenetics of Substance Abuse Disorders (DP1) from the National Institutes of Health Director’s Pioneer Award program. The five-year, $2.34 million award is among a handful of grants given to recognize “highly creative” scientists from the nation’s top universities and to encourage high-impact approaches to the broad area of biomedical and behavioral science. “This is a special award, more so because very few beginning investigators receive this honor,” says Ronald Calabrese, the College’s senior associate dean for research. And, Palmer plans to engage undergraduates to help with his research. He already has hired three undergraduates – Victoria Risner, Pamela Romero and Jenani Srijeyanthan – to delve into specific behavioral questions that will advance his work. Palmer’s work aims to understand how genetic differences contribute to a generalized vulnerability to addiction, first by studying existing DNA samples from hundreds of thousands of people who self-report drug use or those being clinically treated for addiction. Pinpointing regions in the human genome that confer susceptibility to addiction is just the first step of his novel project. The complexity of this behavioral genetic approach then integrates evidence across multiple species, not just humans, that have been or are being studied elsewhere. That will help him prioritize specific genes that explain addictive behaviors. From there, Palmer will be able to develop a predictive model — available to other researchers, not for commercial use — to infer genetic risk for substance abuse. “For me, behavioral genetics is all about understanding people,” he says. Palmer’s Behavioral Genetics of Addiction Laboratory is now about four months into his Pioneer Award research. Students, including graduate student Lauren Bertin, are active members in his work. Bertin is investigating the interplay between executive functioning, self-regulation and problematic substance use. The undergraduate research assistants are similarly focused on using behavioral genetics approaches to unravel the individual differences that persistently emerge in the study of addiction. Risner, a junior majoring in neuroscience and behavioral biology (NBB), is further developing her skills in the analysis of genetic data in preparation for an honors thesis on the relationship between polygenic risk — the summary of genetic effects among an ensemble of markers — for people to favor tangible short-term rewards over potentially greater long-term rewards and how it affects substance use outcomes. Romero, a senior with an NBB major with a computer science minor, is studying the genetics of alcohol withdrawal through various computational methods with the goal of identifying an optimal gene set for alcohol withdrawal. Srijeyanthan, a senior NBB major with a minor in American studies, is developing her skills in functional genomics to identify and integrate expression quantitative trait loci (eQTLs) — loci in the genome that explain a fraction of the genetic variance of a gene expression phenotype — associated with alcohol and tobacco use disorders. “His involvement of undergraduates in research is both ambitious and exciting — undergraduates not only are subjects in the studies but some carry out the research,” Calabrese says. In fact, students not interested in conducting research can choose to become subjects starting next fall. Palmer’s planned “MAPme” project will follow a subset of freshman students for a year, in order to understand how patterns of drug and alcohol use relate to a person’s psychological well-being, personality, genetic profile and level of cognitive functioning. Participants are also being invited to join the MAPme biobank. Building a large biobank of prospective behaviors will be key to understanding the causes of substance use disorders, Palmer says.